If it’s Michigan, it must be Sleeping Bear Dunes. Every summer that I visit Michigan, I try to spend a day in the sprawling Sleeping Bear Dunes National Lakeshore. Every summer I discover a new favorite place. The Pierce Stocking Scenic Drive and Glen Haven. The Port Oneida Rural Historic District and Platter River Point. Wait. We have to get there first. 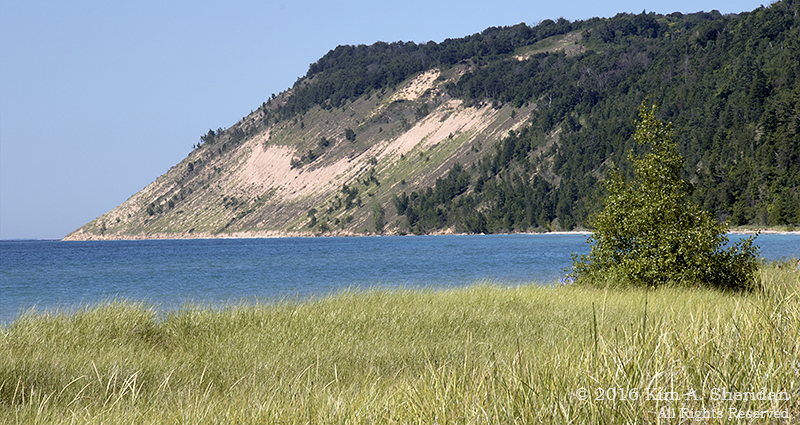 In Sleeping Bear Dunes, the journey is the destination. 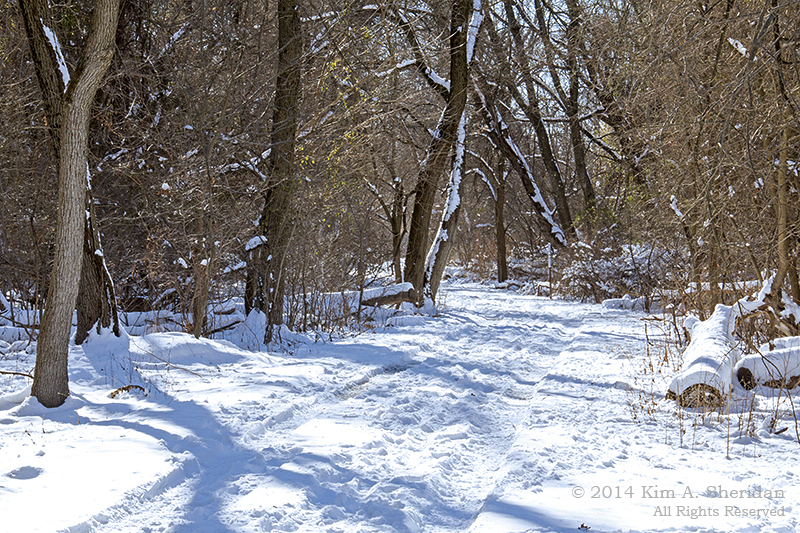 Here are some scenes from the trail. Glaciers played a large role in shaping the hills and lakes of the area, depositing deep layers of sand and debris. 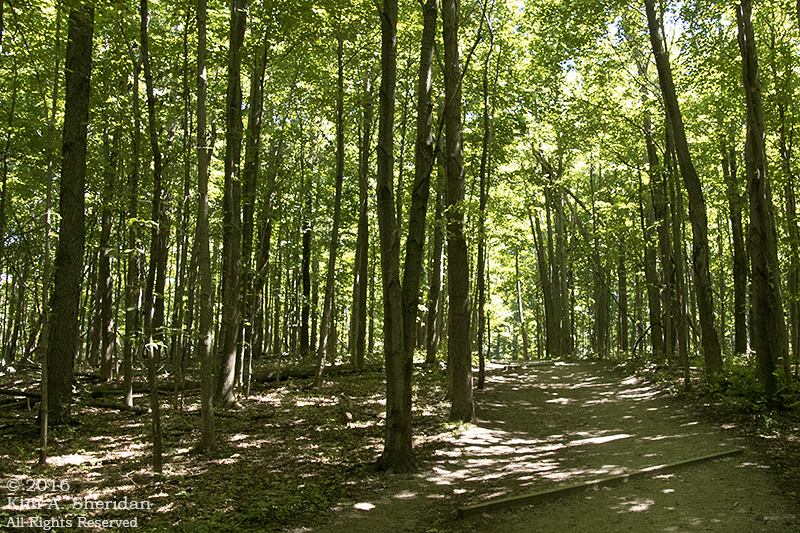 In this poor soil grows a dense forest of maple and birch. Scattered boulders known as “erratics” were carried here by glaciers from their origins far away. Along the path I look at every fern. 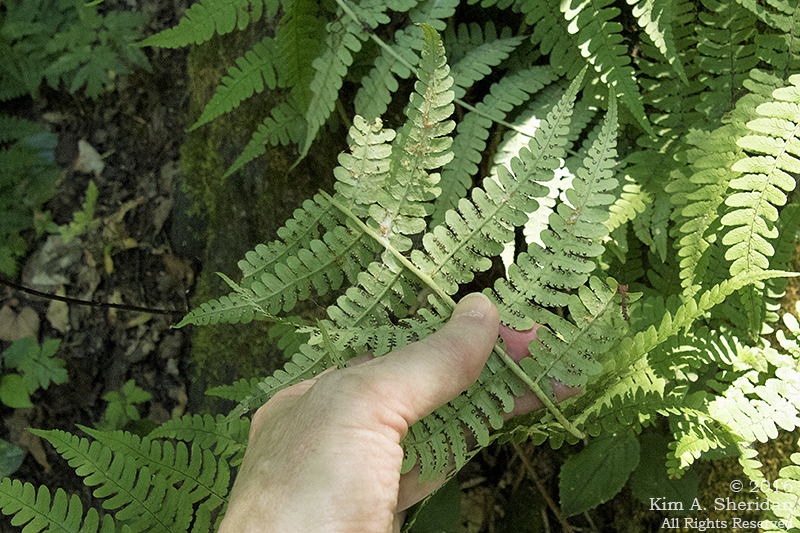 Finally, a wood fern I can identify. See the spores along the margins of the frond’s pinnules? It’s a Marginal Wood Fern! My new friend is bright-eyed and curious. 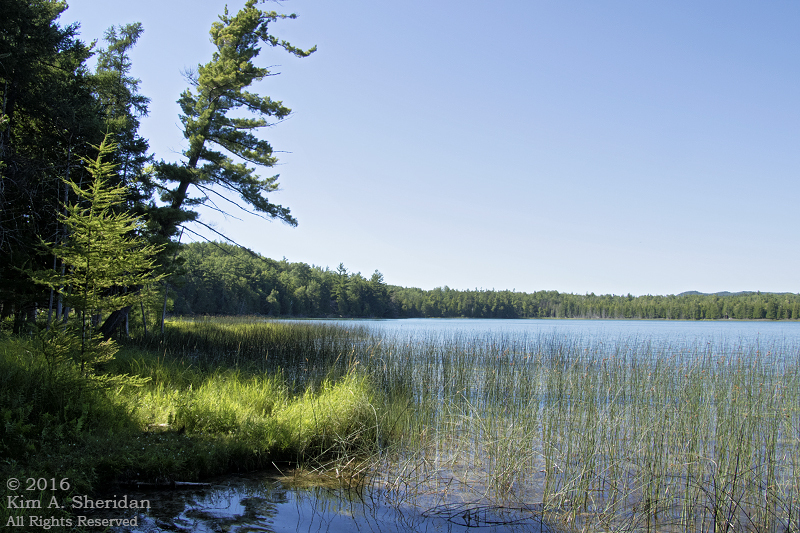 Sunny opening in the woods along the shore of Otter Lake. Look who dropped in for a visit! I live in a suburban development built in 1950. Rows of three-bedroom houses flank sidewalk-lined streets. Lots one-tenth of an acre in size are carpeted in grass, lined with ornamental trees and shrubs and gardens full of non-native flowers. The nearby school draws many children, and car traffic is heavy during the busy times of the day. In other words, there’s not much habitat here for wildlife. 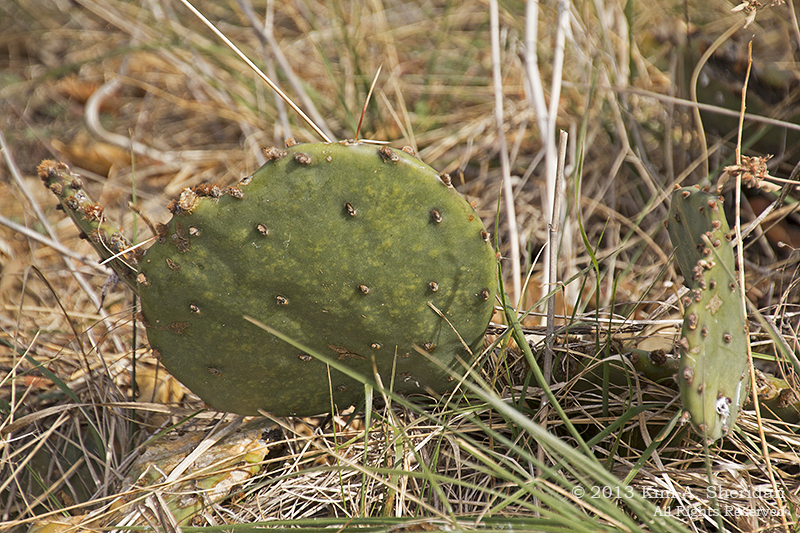 Yet wild critters exist here, and even thrive. 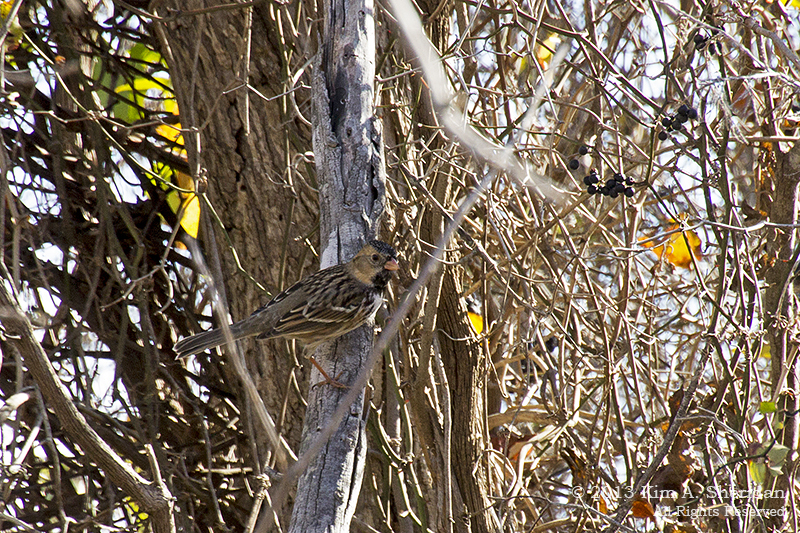 Many of the “backyard” bird species are here. Northern Flickers and House Wrens have nested or tried to nest in my birch tree, there’s another nest with babies in my American holly, and last week while I was reading a Common Yellowthroat warbler walked across my porch as bold as you please. I’ve seen garter snakes in my rock pile, and twice painted turtles took a slow amble through my garden, headed to I don’t know where. 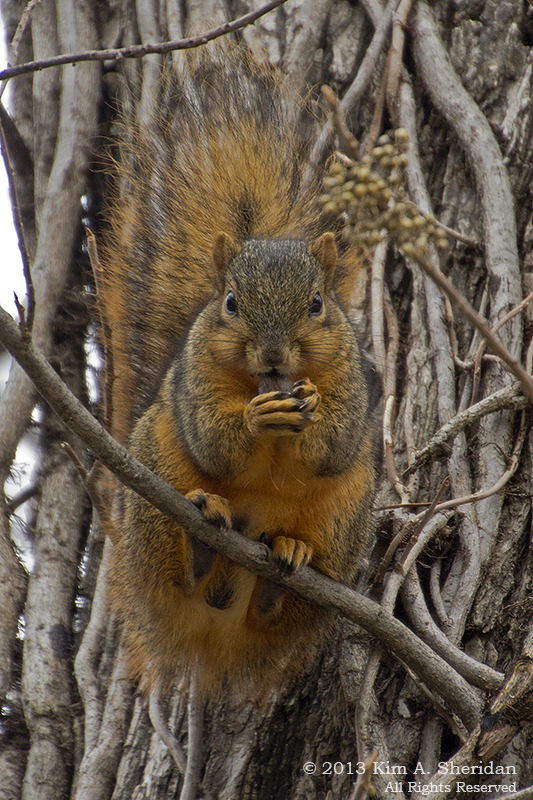 Squirrels and rabbits abound. Raccoons, opossums and small mammals like field mice are around. We don’t often see them, but might see evidence of their passing. To my disappointment, my neighborhood lacks chipmunks. It doesn’t lack red foxes, however. 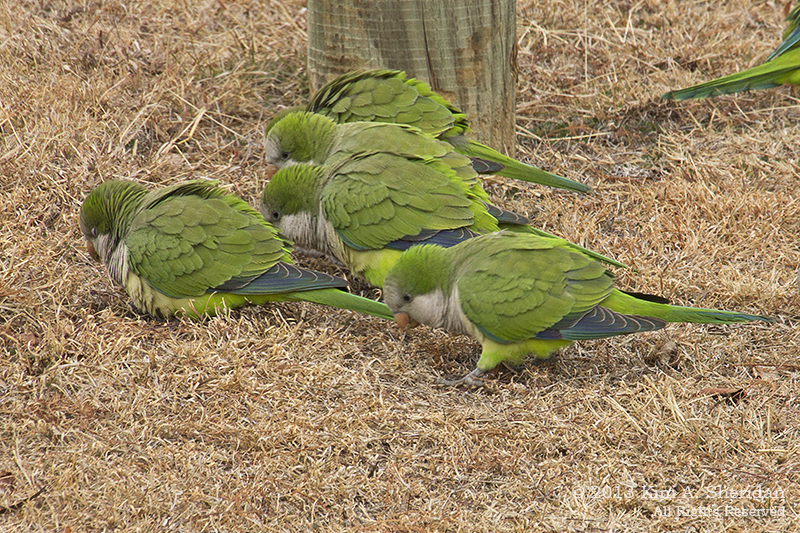 One of these beautiful animals paid a visit early one morning. There is a park a few blocks away. Though it is mostly open grass and playground equipment, it seems to be adequate habitat for the fox family that lives there. 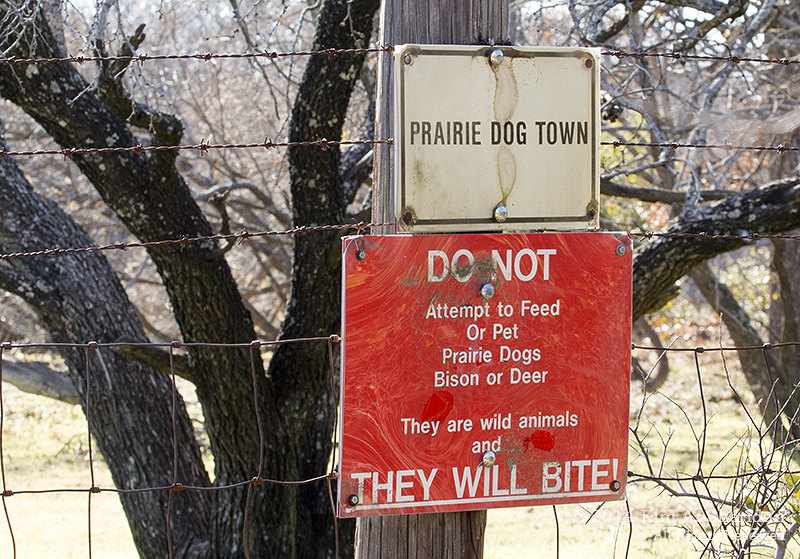 I suspect more than a few of the neighbors are not happy with the presence of the foxes. They worry that the foxes might carry disease or eat their pets. They might like to see them removed; after all, this is a humans’ world, and wildlife has no place in it. Yet many also complain about rabbits raiding their vegetable gardens, and shriek at the sight of a mouse. Those small mammals make up a good portion of the diet of a red fox. Remove the predators, and there will be more rabbits to eat your vegetables and mice to get into your house. Life is a complex web of interrelationships amongst the animals and plants. All are dependent for survival on each other. Through technology and industry, humans have largely removed ourselves from that web. But we still share our space with creatures large and small, and should respect their right to life on their own terms. 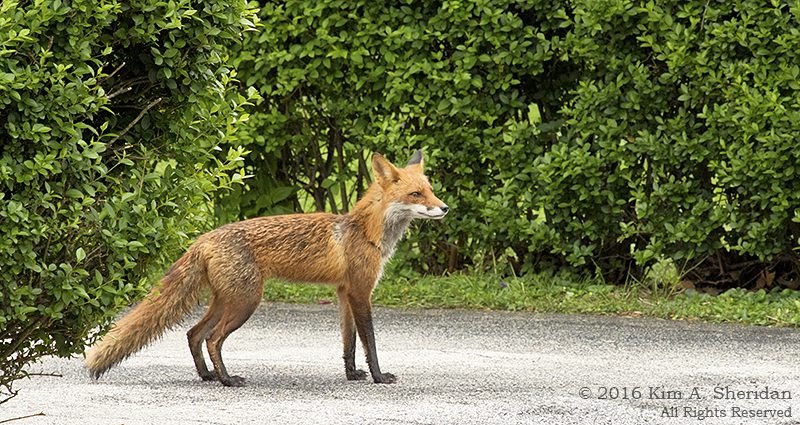 Foxes in the neighborhood remind us that even here we live on the Wild Edge. Long gone are the warm days of summer, days when families crowded the beach with their beach blankets and umbrellas, their sand pails and horseshoe sets. 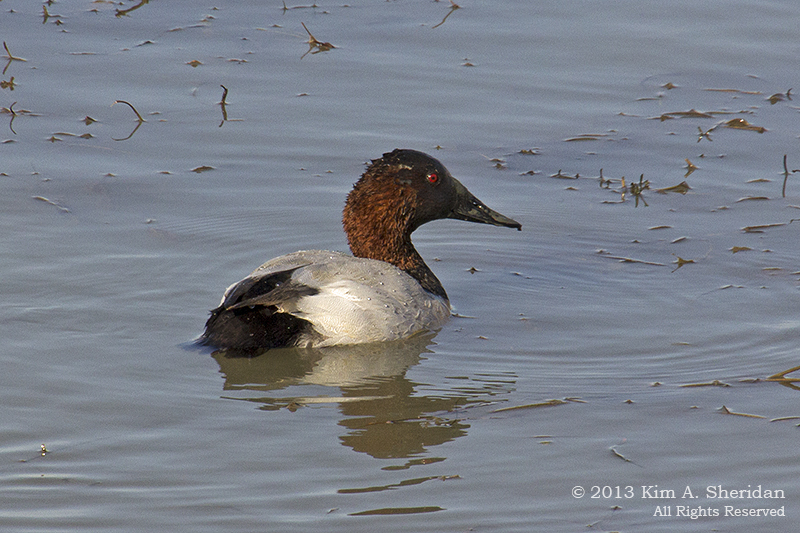 The only creatures frolicking in the surf are ducks. The stiff ocean breeze, so welcome when the temperature was 80°, is a torment at 35°. Autumn lingers, but teeters on the edge of winter. The beach is empty. Of humans, but not of wonders. At last, the beach is ours! 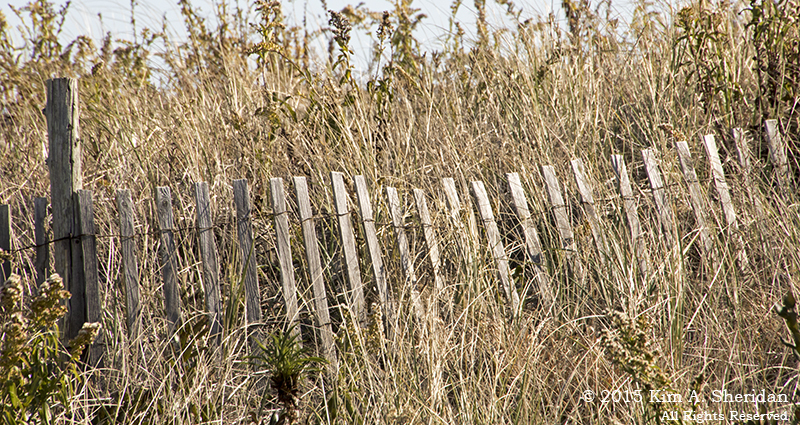 From late fall to mid-spring, the Jersey Shore is ours to explore, empty of crowds and noise. 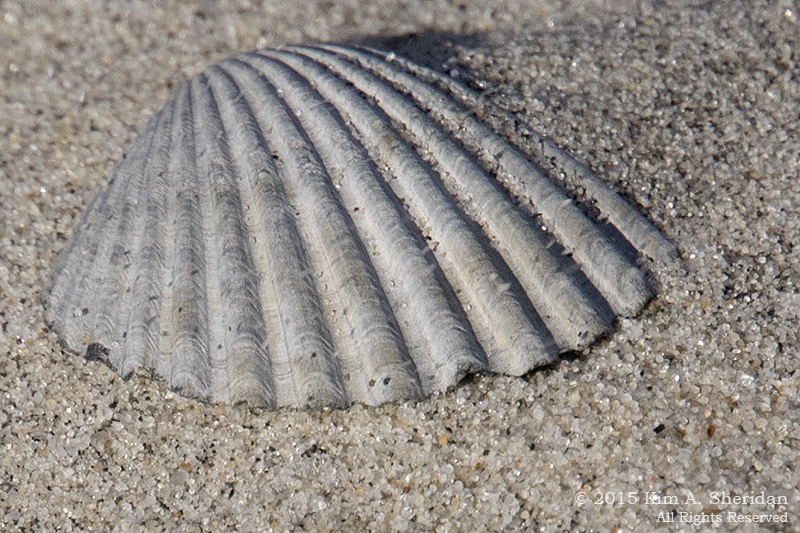 Now there are plenty of treasures to collect, shells and rocks and sea glass, safe from the many feet and the mechanical beach-sweepers of summer. 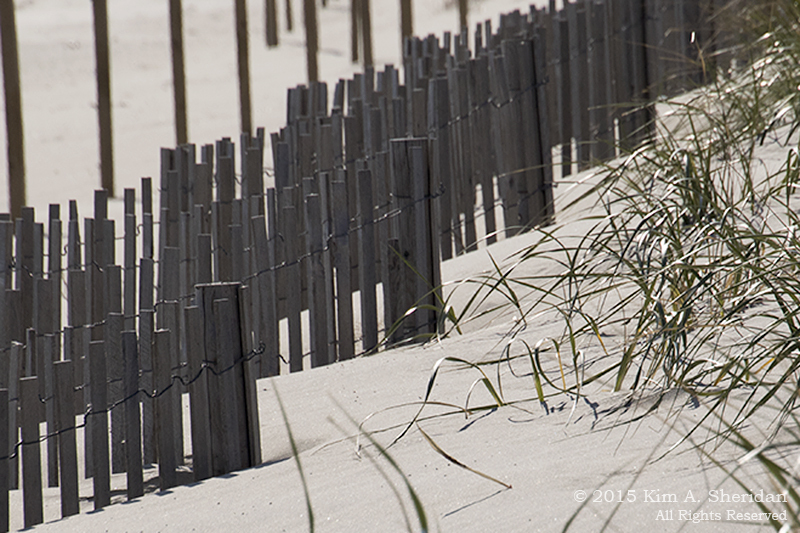 Lines of dune fencing stretch across white sand to the horizon. 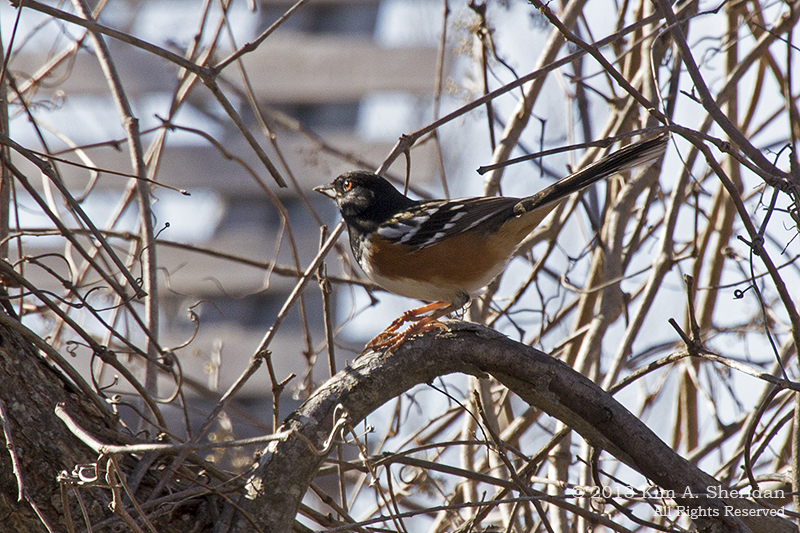 The winter birds arrive at the Shore with the colder weather. 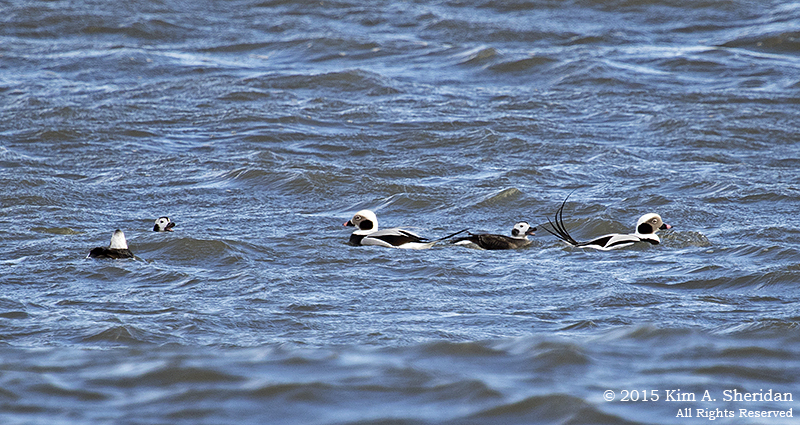 Long-tailed Ducks bob in the waves. 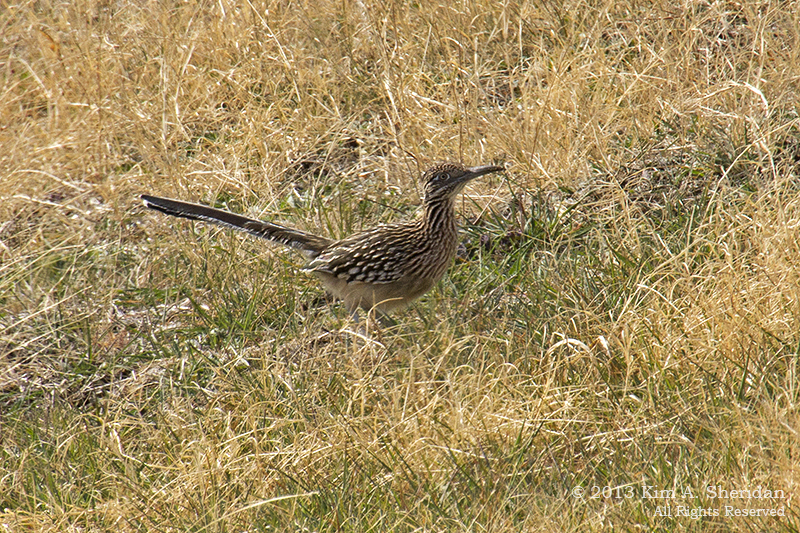 The females seem to have a lot to say to the pink-billed males. 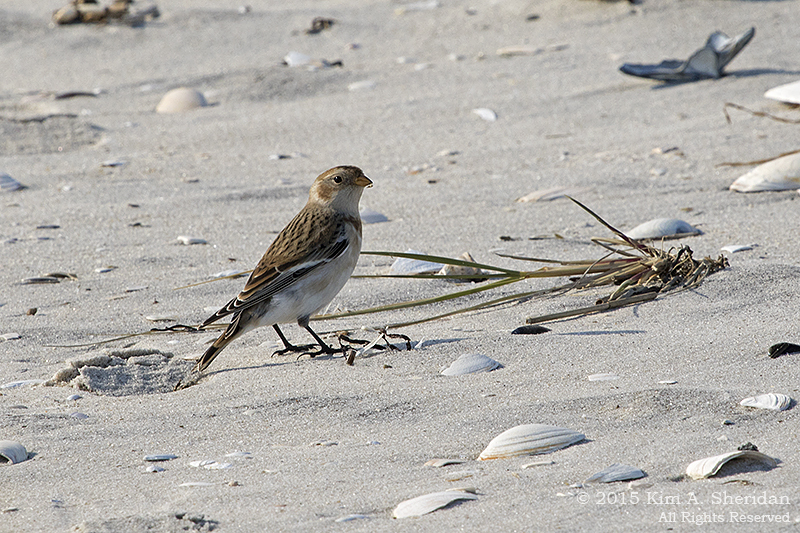 This sparrow-like bird is a Snow Bunting. As we walked along the beach at Holgate one November day, we kept seeing these odd tree sculptures. 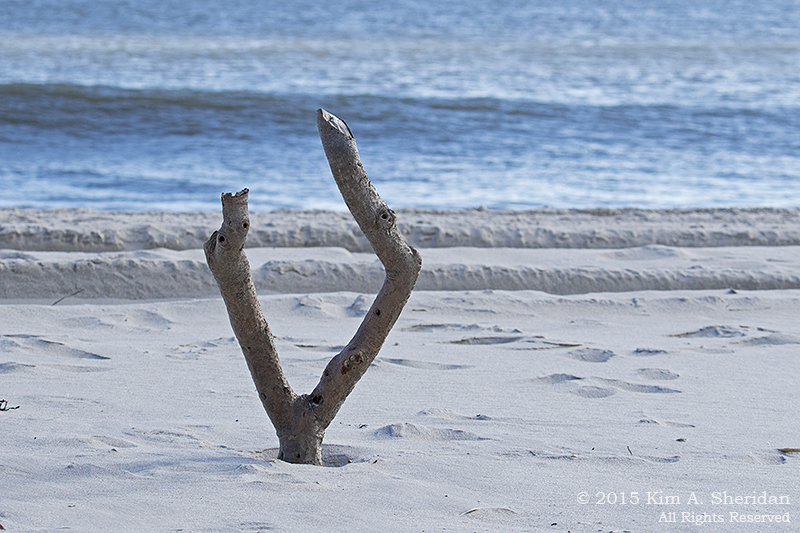 For a bit, we thought some enterprising soul had placed driftwood on end as an artistic expression. Then we realized that these were the broken stumps of dead trees, and we were walking amidst what once had been wooded dunes. 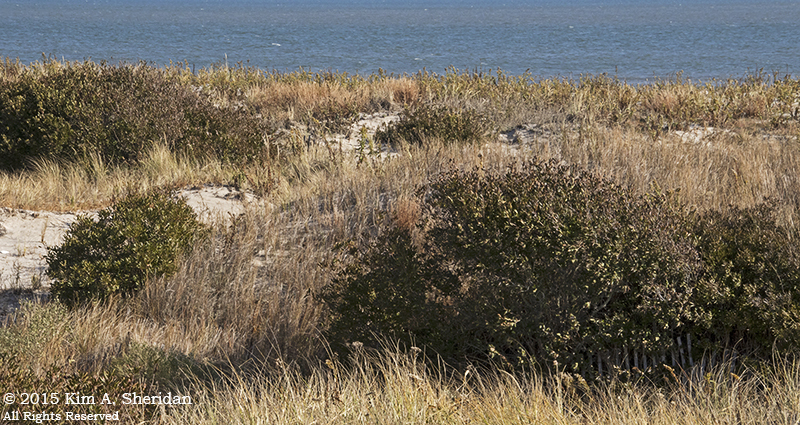 The dunes at Holgate, looking west toward Barnegat Bay. 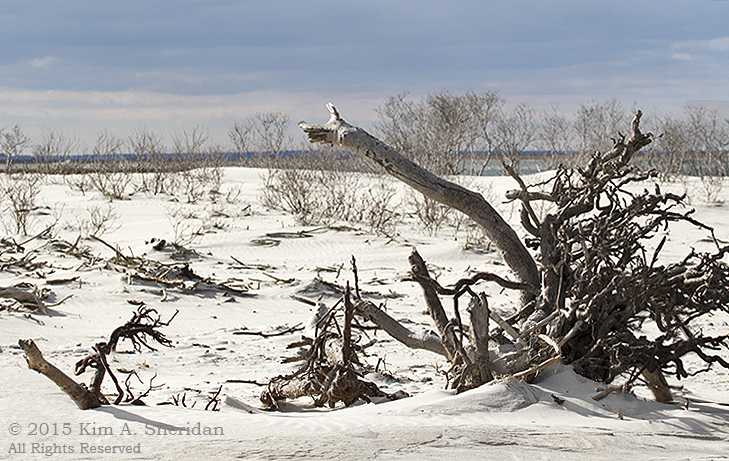 The southern tip of Long Beach Island is a part of the Edwin B. Forsythe National Wildlife Refuge. It didn’t always look like this. 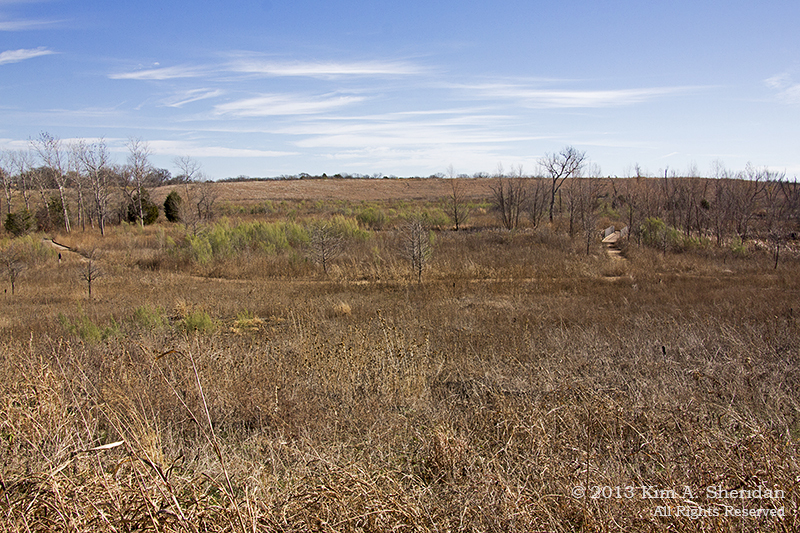 Only a few years ago, it was a thicket of dune plants and shrubs. Then Superstorm Sandy paid a visit, inundating the entire area, breeching the island from bay to ocean in places. These weathered roots, trunks and branches are what are left of once vital vegetation. Devastated, but starkly beautiful. FUN FACT: These plants were flooded with water, but died of thirst. Why? 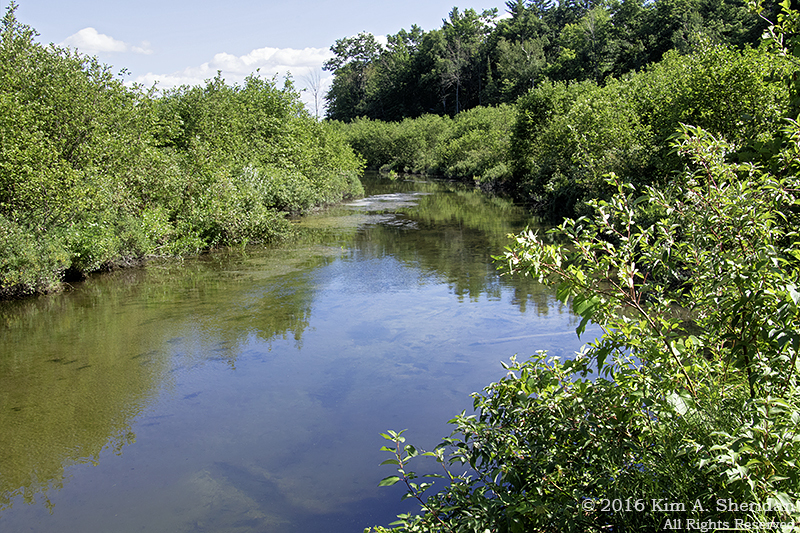 Fresh water flows easily into a plant through the tissues of the roots, a process called osmosis. But this was a saltwater inundation. Ever have a salt shaker gum up in humid weather? 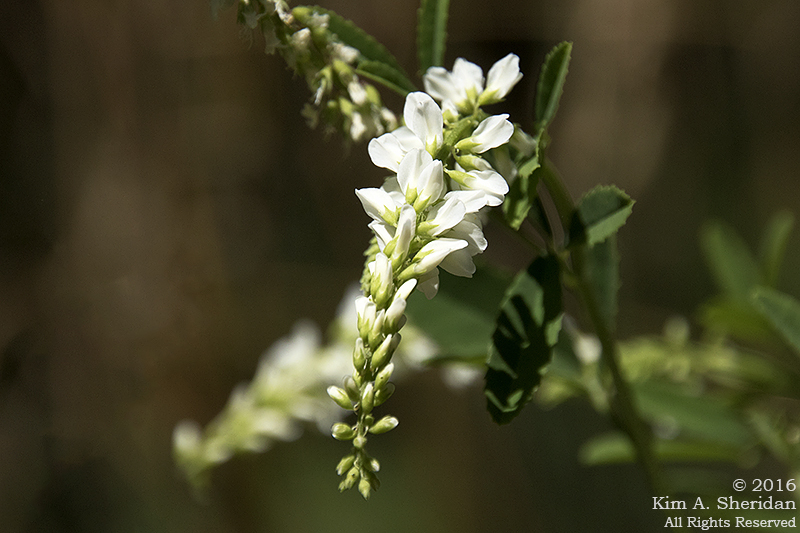 Salt absorbs water very easily, pulling water from the plants into the soil and leading to dehydration. 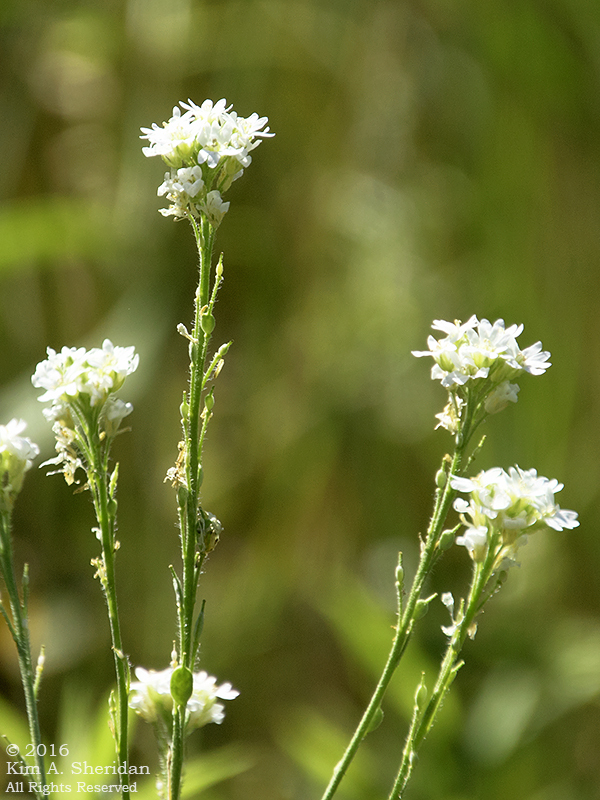 It also interferes with the chemical processes by which a plant obtains nutrients. 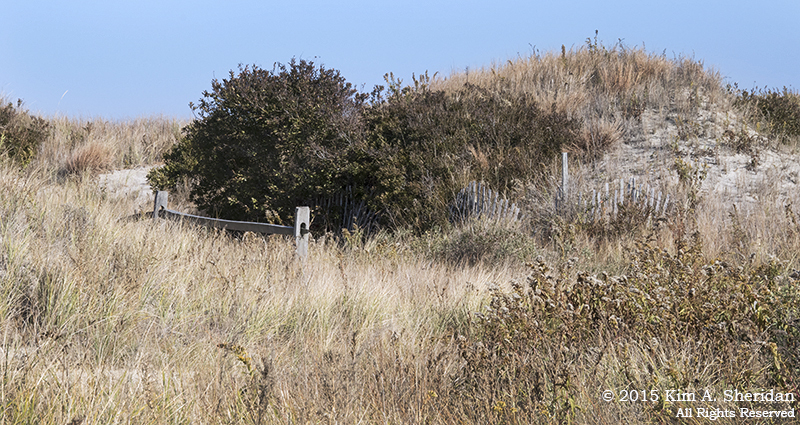 The combination of nutrient and water deficiencies has laid waste to the dune plants. This is what a healthy dune community should look like. Stone Harbor Point. 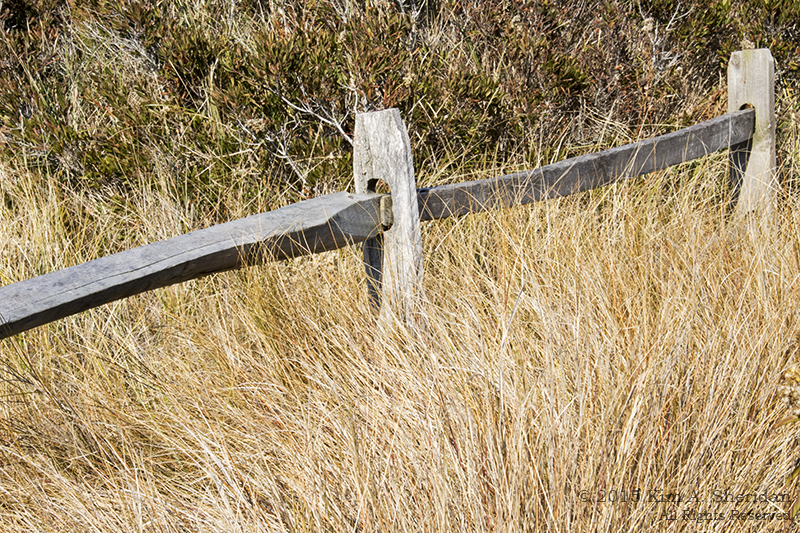 Dune fences make good dunes, and if successful, good dune grasses and plants. 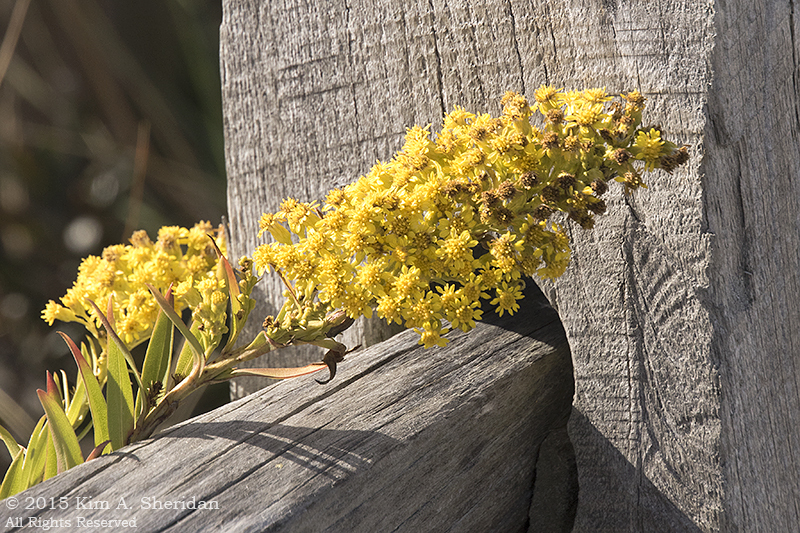 Good fences make good backdrops for wildflowers, still abloom in mid-November. 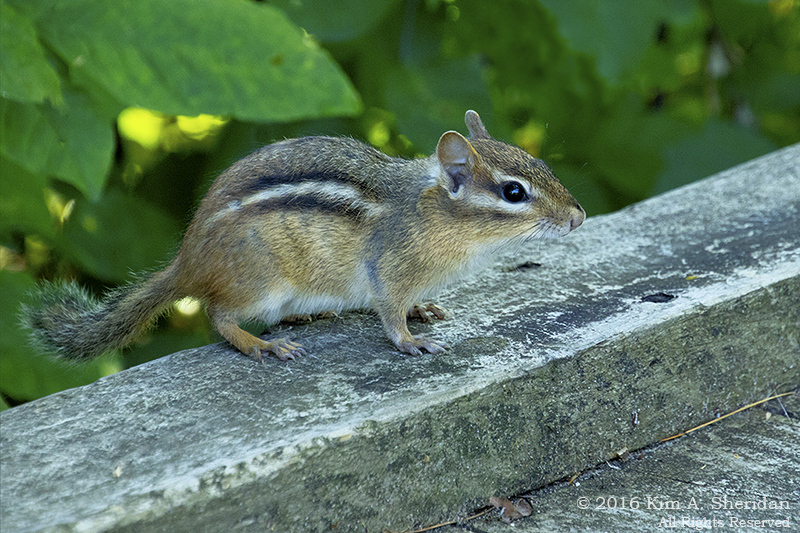 One doesn’t have to go far from the beach to find woodland critters. 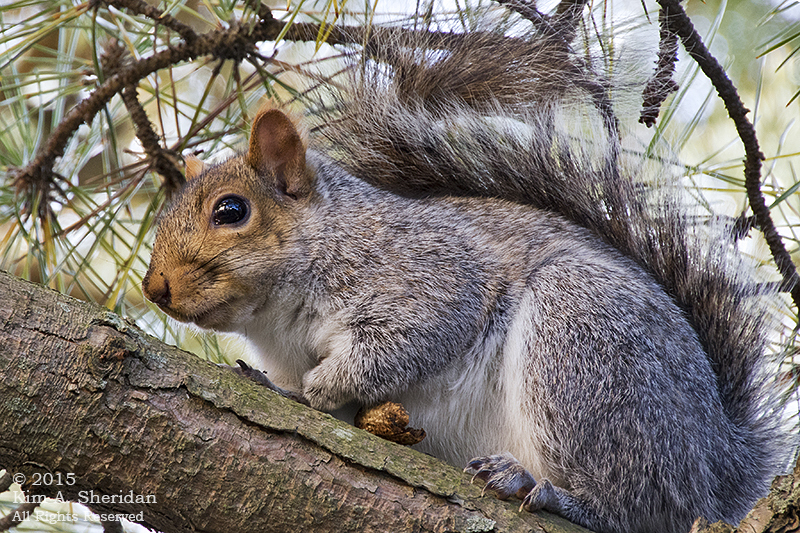 The gardens at Hereford Lighthouse provide a fine place for squirrels to make a living. 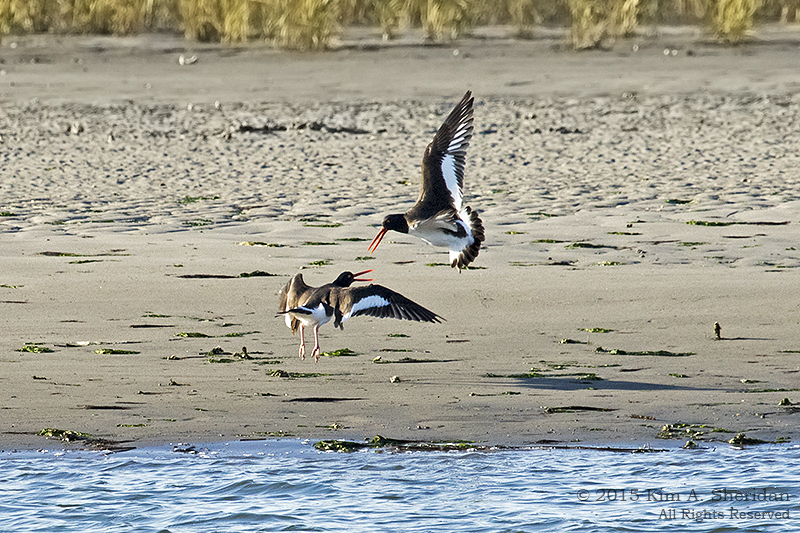 In the late light of day, a pair of American Oystercatchers squabbles. 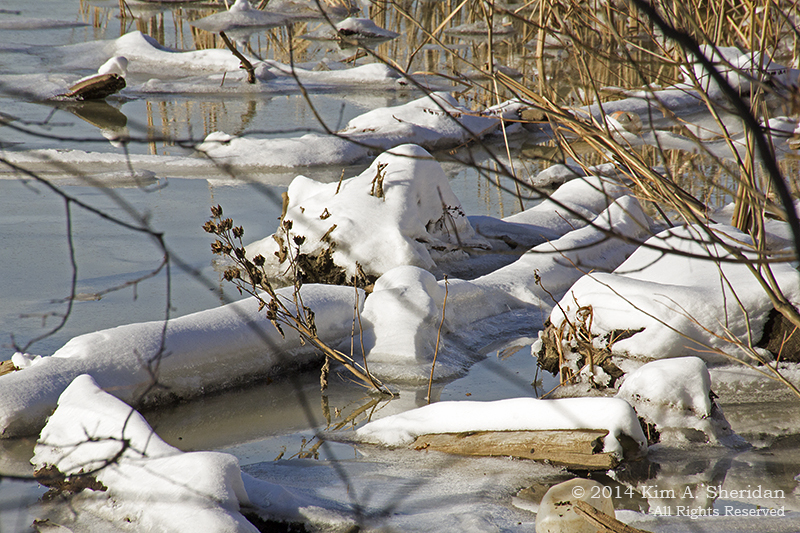 Even on the edge of winter, wonders abound at the wild edge. The Sounding Board: To Hunt or Not to Hunt? First in an occasional series exploring a motley collection of issues. Opinions expressed here are solely those of the Wild Edge Blog Mistress, not WordPress.com. Furthermore they are constantly evolving. Feel free to comment, applaud or argue. Try to change my mind! Please keep it respectful and pleasant. Hmm. Snow goose windsocks. A loudspeaker was playing goose calls, and a man in white coveralls lay prone amidst the faux geese. My first thought was that there was some sort of research project going on. How naïve. It took several days for me to realize that this was a hunting layout. Snow goose hunting was banned in 1916 when population numbers were too low. Since the geese discovered the waste grain bounty in the 1970s, snow goose populations have boomed. The Atlantic Flyway population that passes through Pennsylvania has grown from 50,000 in the mid-1960s to over one million in recent years. 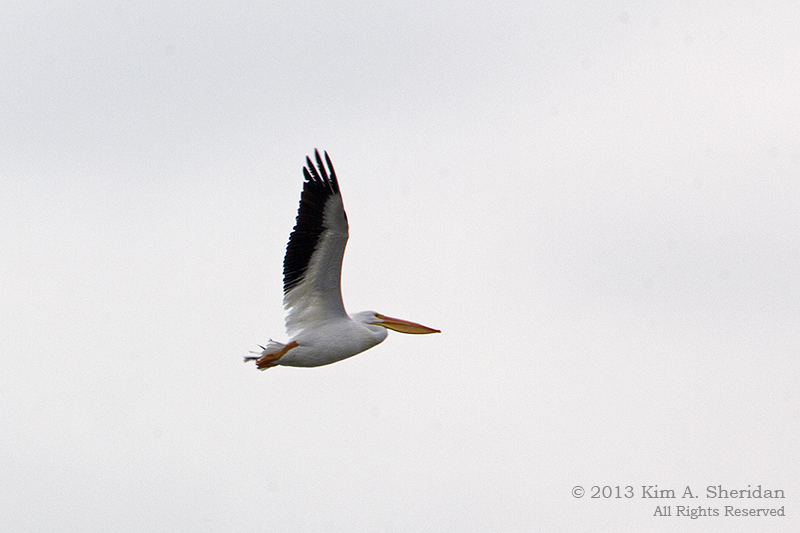 Other flyway populations are expanding even more. Estimates have placed total growth at close to 9% a year. It turns out you can have too much of a good thing. 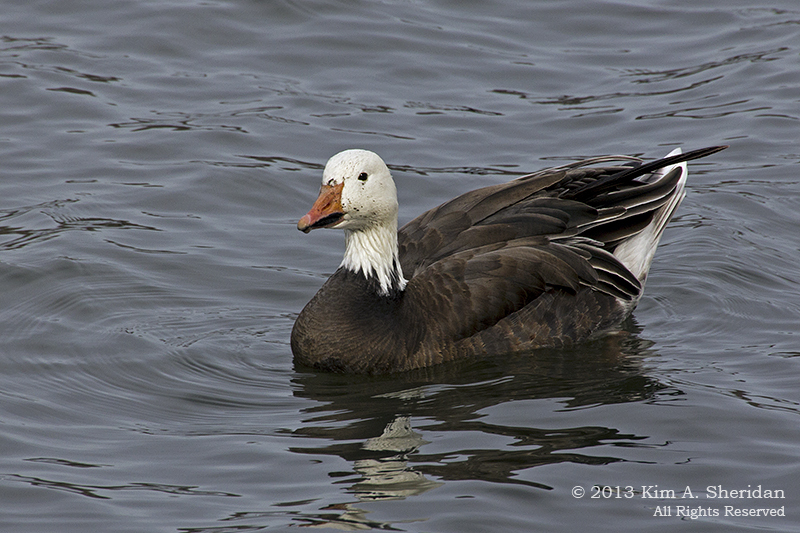 The exploding numbers of snow geese have put tremendous pressure on habitats the goose uses. 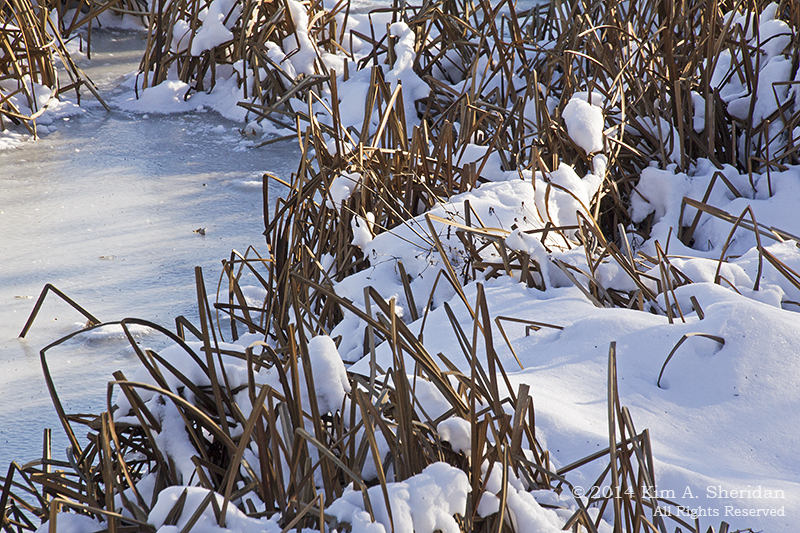 Particularly vulnerable are the fragile Arctic wetlands where the goose breeds. The damage caused by these voracious eating machines not only impacts their own breeding success, but threatens that of nesting shorebirds and other species that share their habitats. Snow goose hunting was reinstated in the 1970s for population control. Today, a population goal of 500,000 has been set for the Atlantic Flyway population, and in 2008, the USFWS has finalized a Conservation Order allowing Pennsylvania and other states to conduct a Conservation Hunting Season for snow geese. The conservation season differs in that it extends into the migration season, and allows the use of electronic recordings and decoys. 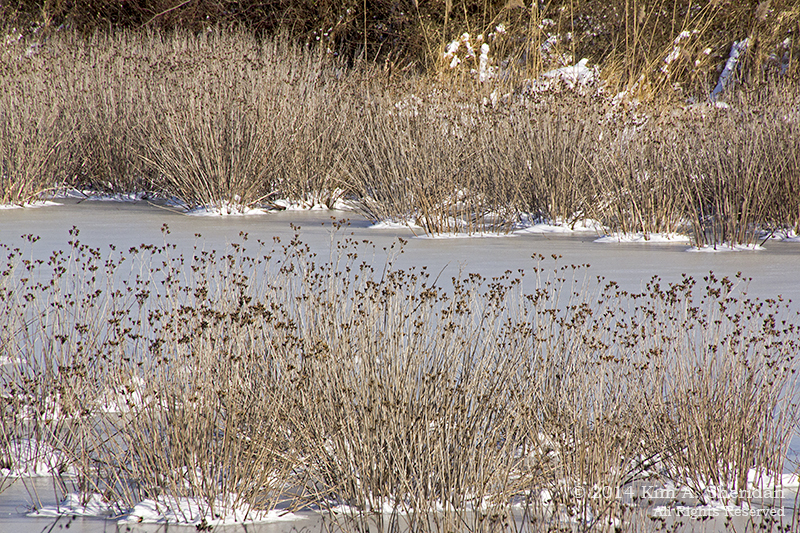 Middle Creek WMA is both a refuge for migratory snow geese, and a strictly-monitored hunting area where specially licensed sportsmen can hunt geese for the purpose of population control. 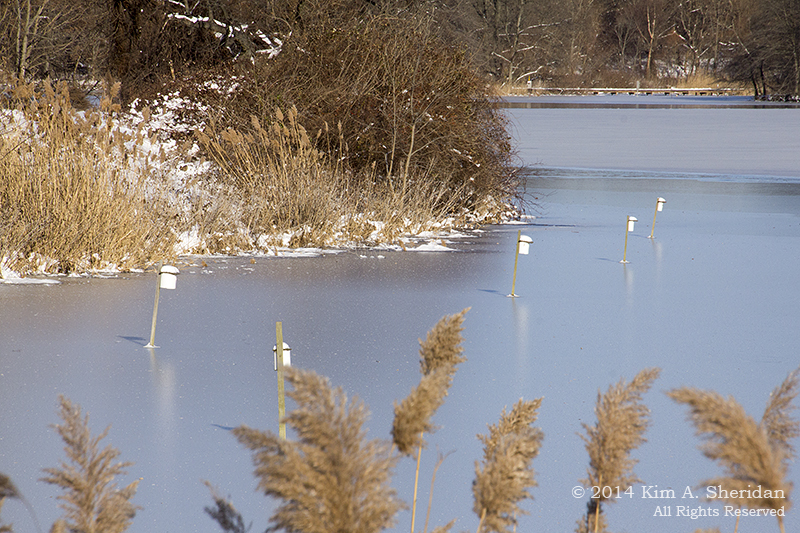 I should mention that there were no live geese to be seen anywhere near that field. Those goose decoys? Clearly the real ones weren’t buying it. I’ve got a love/hate thing going with hunting. On an individual basis, I hate to see any animal die before its time. Nature has other ideas, of course; big fish eat the little fish, bigger fish eat the big fish, and so on. The cycle of life. But Man stepped in and started monkeying around with the system, removing predators, destroying habitat, suppressing wildfires, hunting, or banning hunting. We humans bear a heavy burden of responsibility to step in and manage populations so they don’t get out of control. Take the white-tailed deer, for instance. In Pennsylvania, like so many other places, it’s a pest. 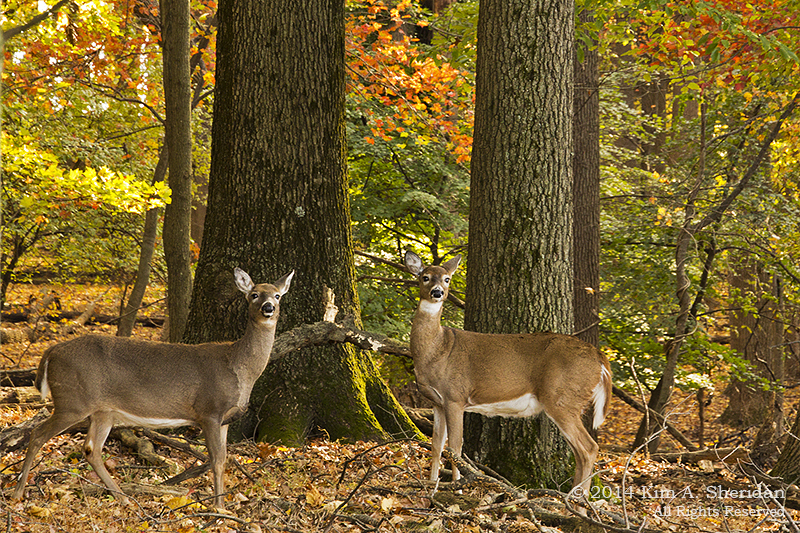 Way too many deer are living in habitat that can support a population a tenth of its actual size. 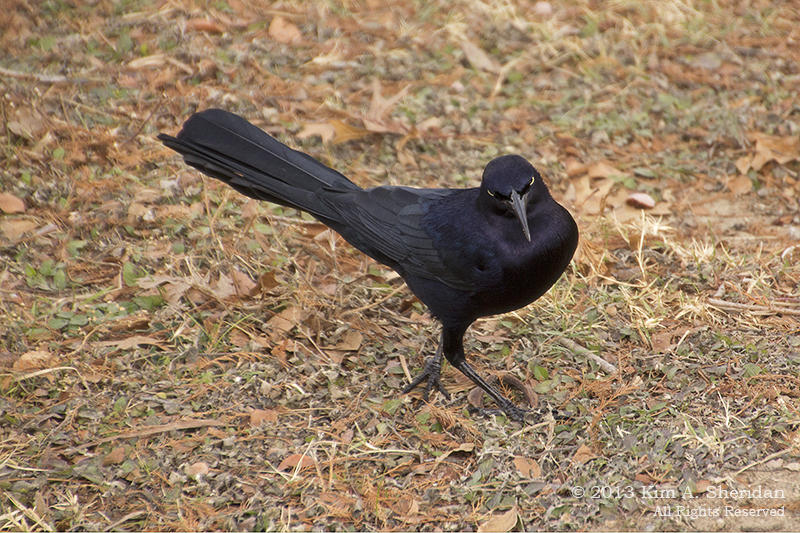 The deer destroy the understory that many other critters, from songbirds to small mammals, depend on. Not to mention the damage a car-deer collision can do, to both car and deer, and in my area these encounters are legion. 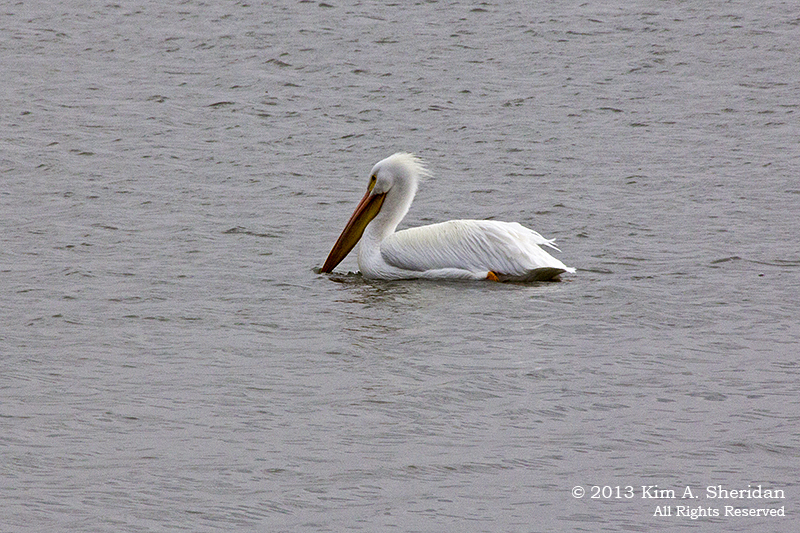 Deer, and snow geese, are beautiful animals, and I love seeing and photographing them. But I also see the bigger picture. Populations have exploded, largely due to the intervention of Man. 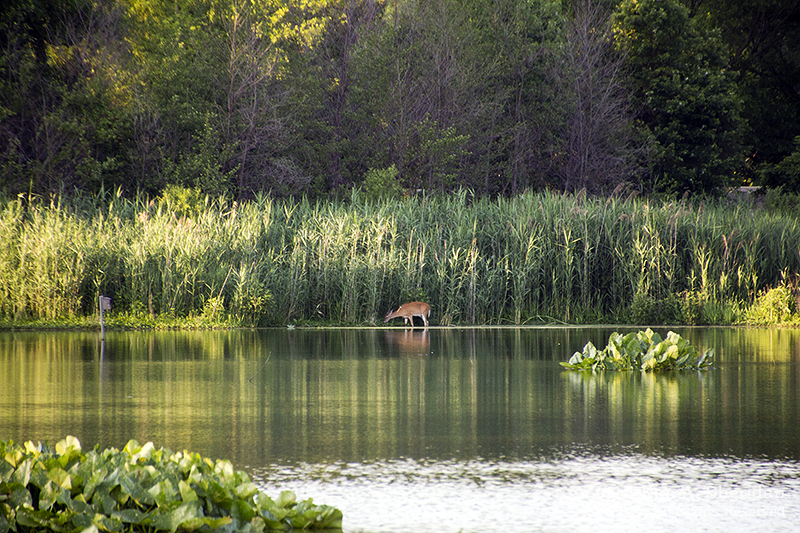 Is it right to allow other animals suffer from the habitat depredation caused by the deer and geese? Is it right to allow the deer to starve in the winter when there isn’t enough browse to support the whole population? I don’t believe so. Are there answers other than hunting? Maybe. I won’t go into deer contraception here. That’s a controversial issue that is beyond the scope of my expertise. I will say only that my gut tells me it’s inadequate to the job of managing the deer effectively. Man created this problem, and has a moral imperative to seek solutions. 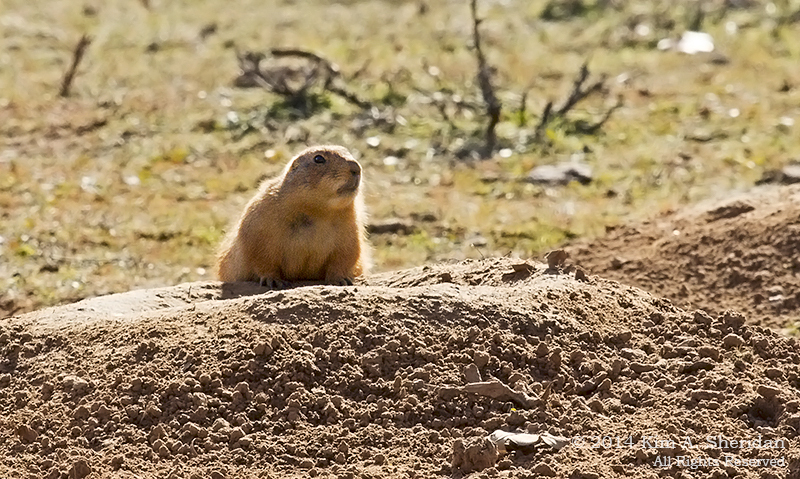 Well-regulated hunting is an important tool maintaining animal populations at a level healthy for themselves and the other species with which they share their environment. 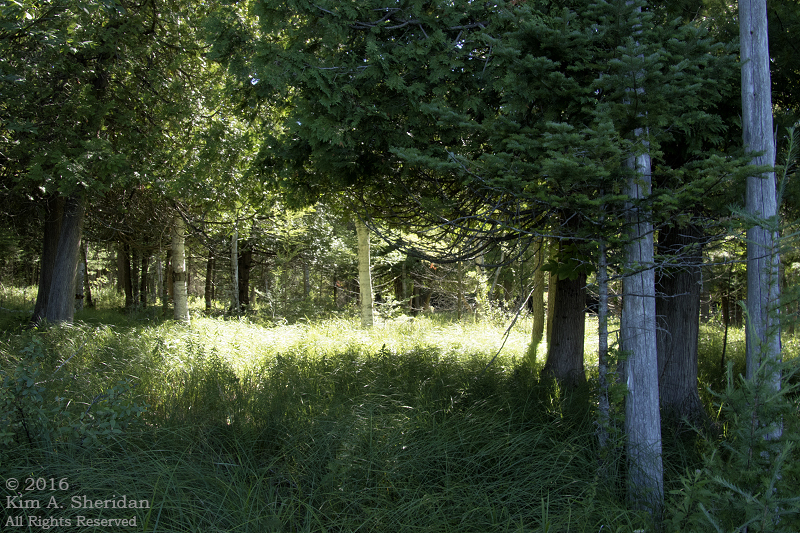 Sometimes you have to take a step back to see the forest rather than the trees. The mere threat of a snowstorm is enough to induce panic. We scurry to the store to buy milk, bread and eggs – obviously in desperate need of French toast – and then hunker down as if we won’t be free of our homes for a month. When the snow stops, all we can see is the hours of shoveling, and the icy roads on which we’ll have to skid our way around town. We’ve lost our childhood delight in the wonders of the falling snow, in the way it transforms even the most familiar landscapes. Fortunately, there’s a cure for this malady, and it’s a simple as picking up a camera and looking at the white-frosted world through its lens. 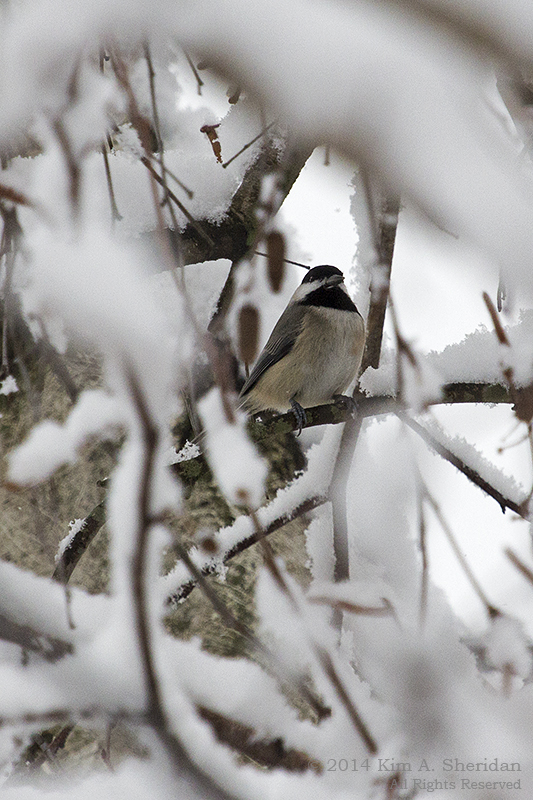 During the storm, a Carolina chickadee finds shelter in a gray birch tree, while a dark-eyed junco finds plenty to eat under my bird feeders. 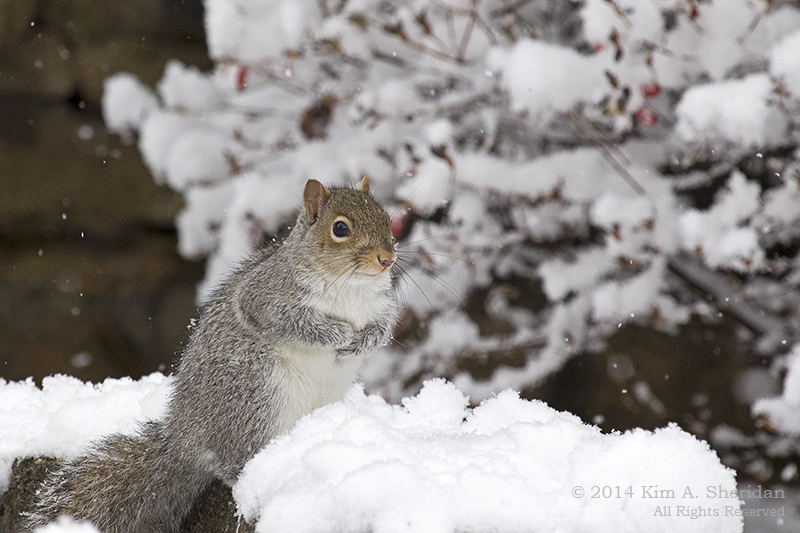 Mr. Squirrel ignores the food in front of him, and instead plots to raid the can of birdseed. The grass is always greener to our furry friend. 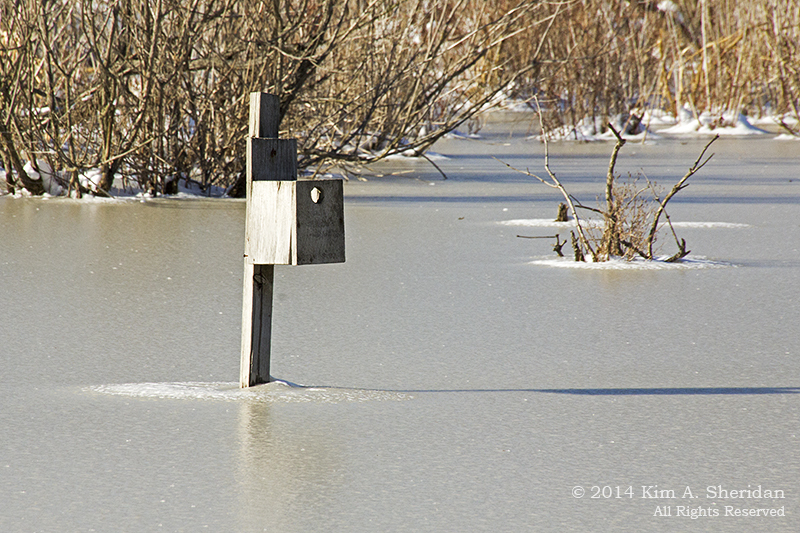 A sunny day right after the storm entices us out to walk the trails at Heinz NWR. This is the first time I’ve seen the Refuge covered in snow, and it’s delightful. 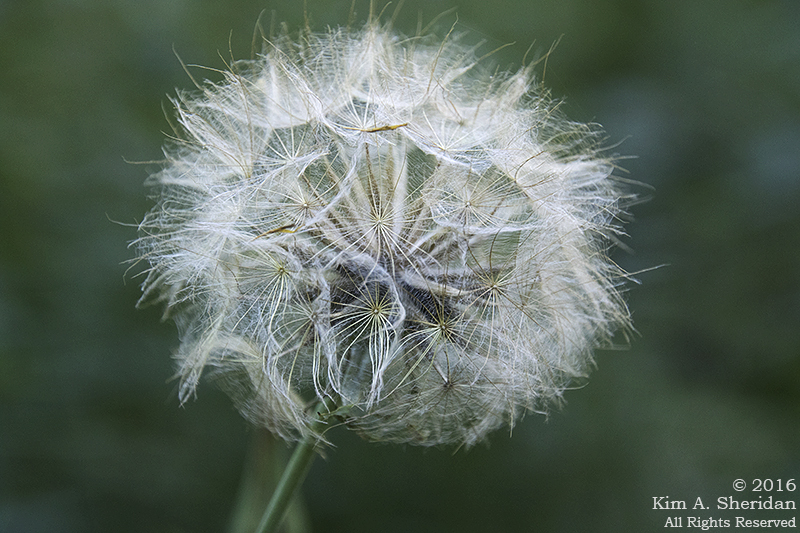 Even the most ordinary things take on a new look. 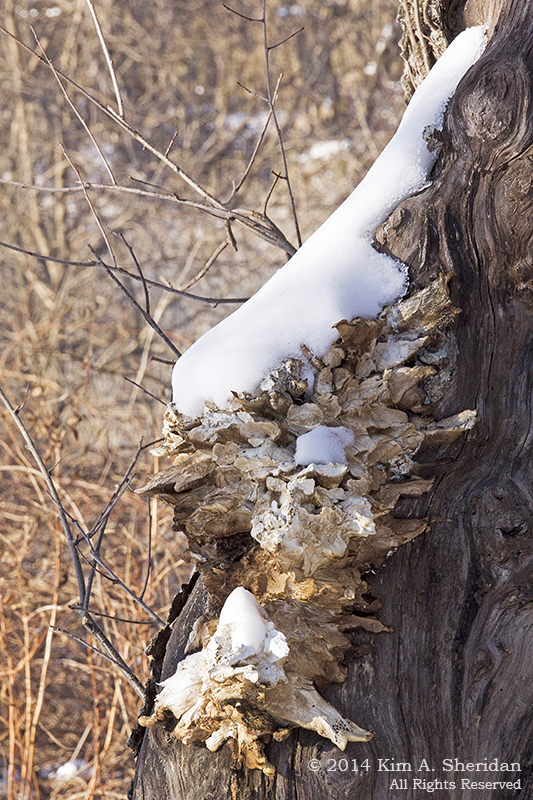 Our old friend the chicken fungus now wears the face of Old Man Winter. 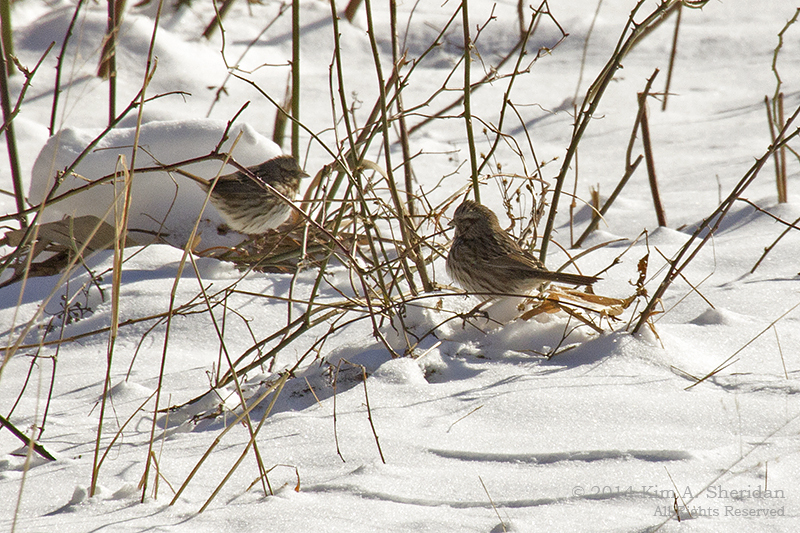 Sparrows flit about among the grasses. 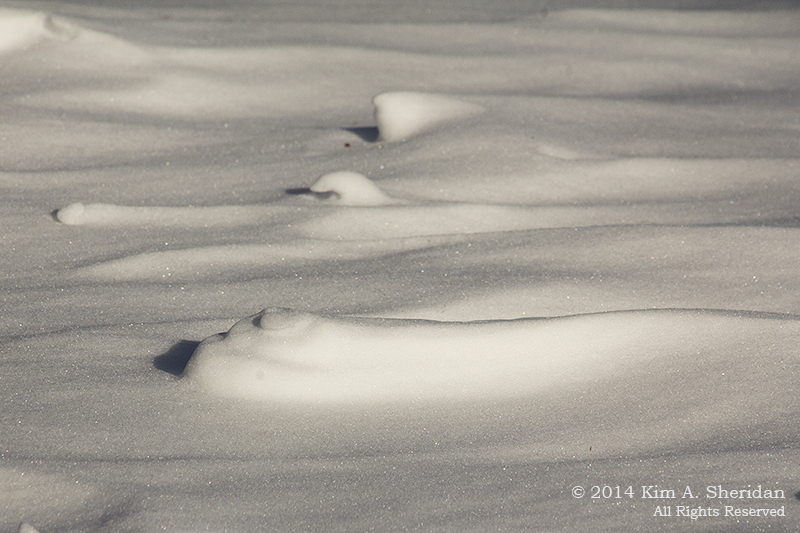 We see tiny bird tracks and larger deer tracks everywhere. 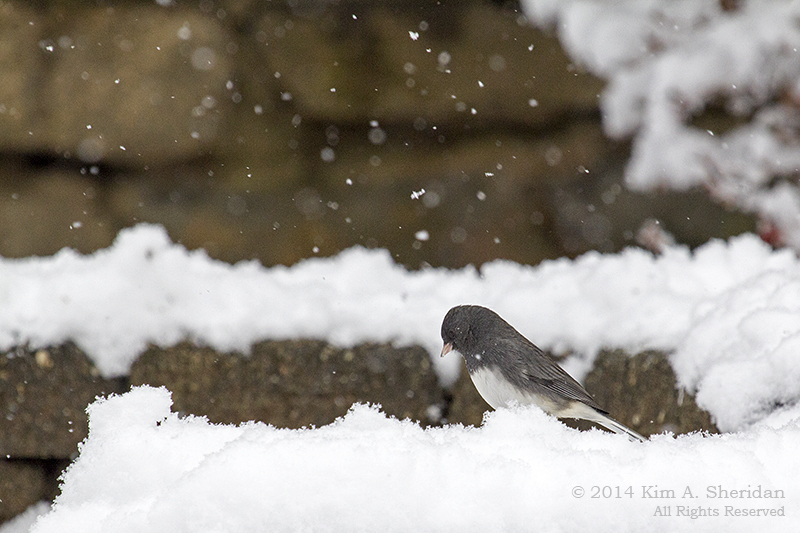 The snow is like Facebook for critters, recording their every movement for us to read. 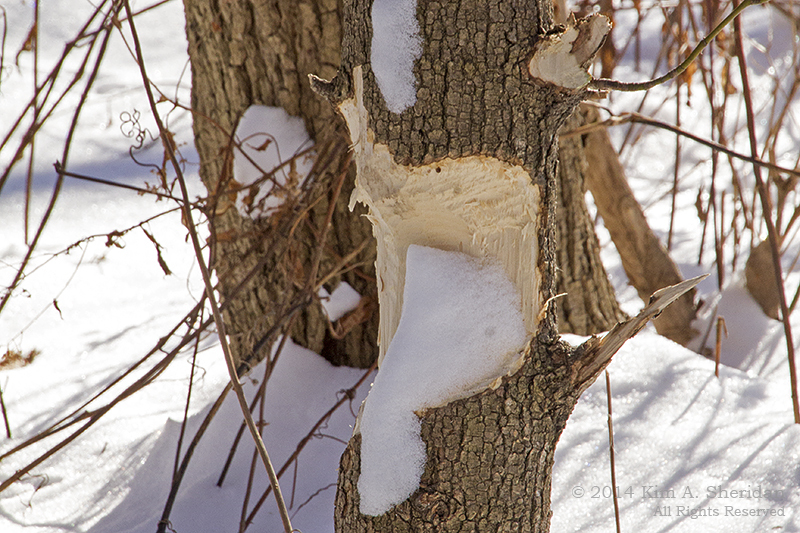 Winter is the time for beavers to get busy. Even a 2° morning has its charms. 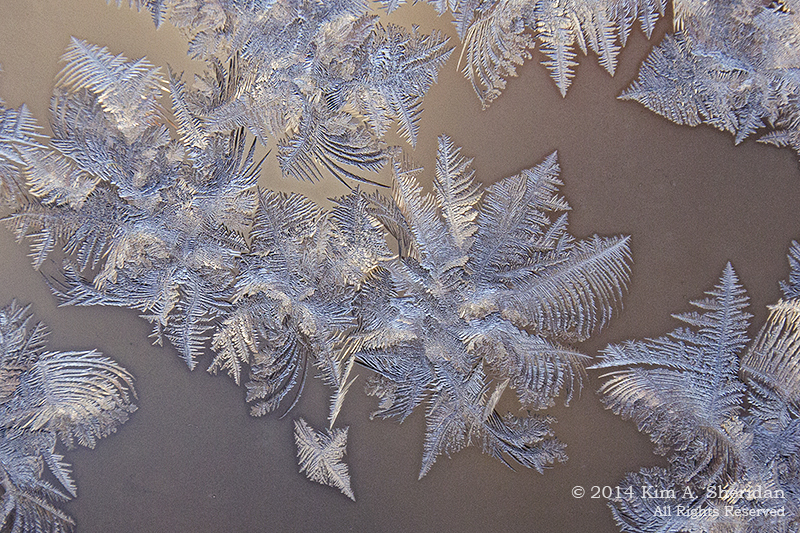 The polar vortex etches little ice feathers on my windows. Look quickly! The warmth of the house starts melting these beauties before I can even finish photographing them. It’s so easy to come down with a case of snow panic with every storm. We all need to slow down, stop worrying and put down the shovel long enough to partake of the cure. 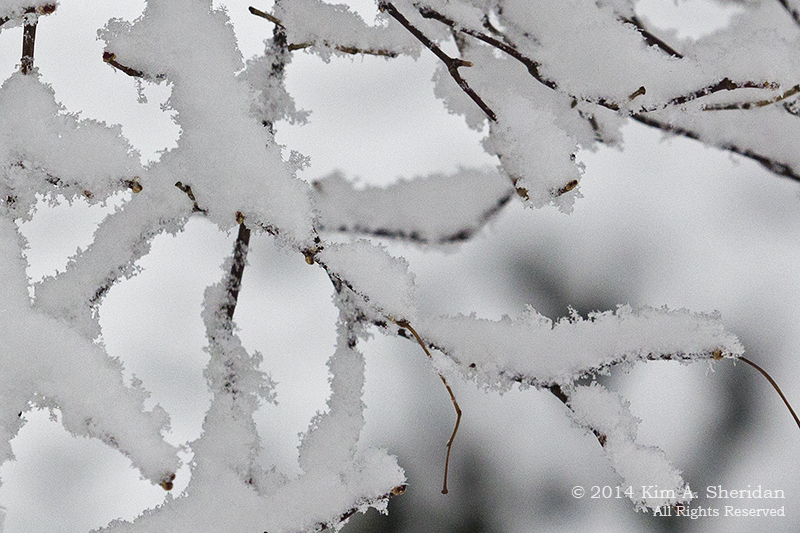 An unhurried walk in a winter wonderland gives us a fresh look at our familiar world, and the gentle touch of Mother Nature’s magic lifts our souls.